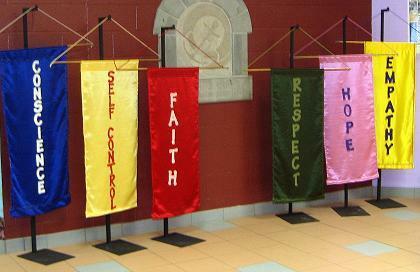 We offer custom-made banners, altar/lectern hangings and stands for your parish, school or chapel. Each article is crafted with care and attention to detail. Contact Linda to set up an appointment for a free consultation. Please allow 6 to 8 weeks for delivery. The photo above showcases our versatile adjustable banner stands with a client’s banners. Click here for more samples.